When I was home over winter break, my Dad gave me his copy of Valley Potato Grower magazine (yes, there is such a thing — and yes, you receive such a publication if you work in the food biz!). He bookmarked this recipe and said I should try it. I’ve never heard of potato cake. Potato bread, yes. But not potato cake. 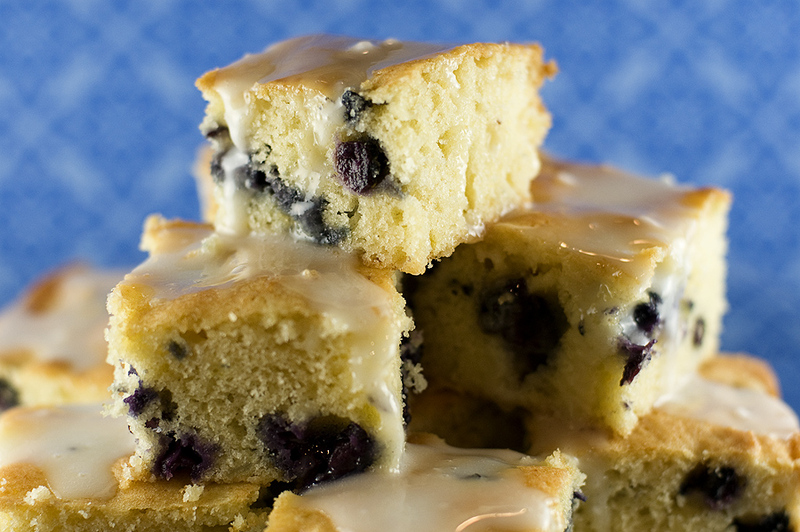 I liked it — this treat is a hybrid of a blueberry muffin and blueberry coffee cake, with a subtle taste of potato. 1. Preheat oven to 350F. Grease and flour a 9×13″ pan. 2. Put potatoes in a small pot with cold water. Boil until potatoes are tender. Drain well, then mash. Set aside 1 cup of mashed potatoes. 3. Sift together flour, baking powder, and salt. Stir in the blueberries to coat them in the flour mixture. Set aside. 4. In a large bowl, cream together the shortening and sugar until light and fluffy. 5. Mix in the warm cup of mashed potato. Beat in the eggs one at a time, then stir in the vanilla. Stir in the flour mixture with the blueberries, mixing just until incorporated. 6. Pour batter into prepared pan and bake for 45 minutes (or until a tester comes out clean). 7. Allow to cool; spread a thin layer of glaze on the cake (to make glaze, just combine all glaze ingredients and mix well).